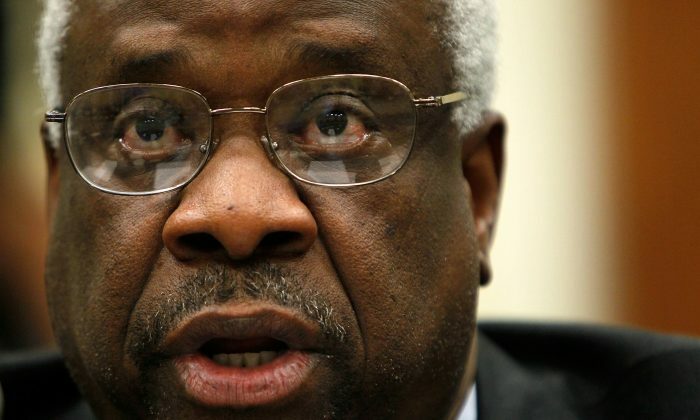 Clarence Thomas, the only sitting African American Supreme Court Justice, dismissed point-by-point the arguments for affirmative action on Monday by showing their similarities to 1950s segregationist arguments. He drew the comparisons in an opinion published Monday, June 24, as the Supreme Court made a landmark decision in an affirmative action case. The University of Texas rejected the application of Abigail Fisher, a Caucasian Texan. She argued that the university’s admission policies are discriminatory; race is one factor taken into consideration, in an aim to promote diversity as a boon to education. The Court ruled that the lower appeals court failed to apply sufficiently scrutiny in its ruling, and that the appeals court must review Fisher’s case. But Monday’s ruling did not challenge the foundations of affirmative action established by a 2003 precedent, Grutter v. Bollinger, which upheld the University of Michigan Law School’s consideration of race in its affirmative action policy. “The argument that educational benefits justify racial discrimination was advanced in support of racial segregation in the 1950s, but emphatically rejected by this Court,” he wrote. He listed a few benefits touted both by affirmative action defenders and by segregationists: the promotion of peace or tolerance among races, the creation of better leaders, and the benefits to schools. The University of Texas holds that affirmative action prepares students to be leaders in a diverse society. Segregationists once argued that African American students could only develop leadership skills in a separate school, as they would inevitably play second fiddle to Caucasian students in integrated schools. “It is irrelevant under the Fourteenth Amendment whether segregated or mixed schools produce better leaders,” Thomas wrote. Thomas likewise dismissed the educational benefits of student body diversity. He noted that segregationists argued Caucasian students would leave the public school system for segregated private schools, draining the resources and support needed to run the public schools. This did, in fact, happen to some degree. Yet the Court maintained its ruling against segregation even as the public schools suffered closure. “If a State does not have a compelling interest in the existence of a university, it certainly cannot have a compelling interest in the supposed benefits that might accrue to that university from racial discrimination,” Thomas concluded. “There is no principled distinction between the University’s assertion that diversity yields educational benefits and the segregationists’ assertion that segregation yielded those same benefits,” he said. Minority students often suffer academically, not being as well-prepared as other students who entered the university on merit of academic achievement alone, he said. Minority students who do gain admission by academic achievement are often lumped in with the affirmative action students, as there is no visible distinction. Justice Anthony Kennedy stated in his opinion that scrutiny is important in affirmative action. The race consideration must not deteriorate into a fulfillment of quotas, he said, but must be evaluated alongside multiple and complex factors in the assessment of an individual. Scrutiny must be applied to ensure the consideration of race is, as it was intended in the Grutter ruling, used to fulfill the university’s educational mission and goals. The University of Texas also maintains ethnic diversity by admitting students in the top 10 percent academically from all schools within Texas. Justice Ruth Bader Ginsberg was the only Justice to dissent, saying the Fisher case does not require review. Ginsberg supports the university’s affirmative action policies, saying she prefers such covert policies to unofficial practices of considering race.